The first Saint John the Evangelist Church Barrhead was built in 1841 in Prior Park just off Darley Rd. No doubt one of the saddest events in Saint John the Evangelist's history must be the destruction by fire of the old Gothic Saint John the Evangelist Church in 1941, not by enemy action but by an electrical fault: a short circuit and a terrifying blaze. There is one WW1 Grave in the old grave yard that sat besides the old church. Regiment/Service: Royal Scots Fusiliers, 6th/7th Bn. 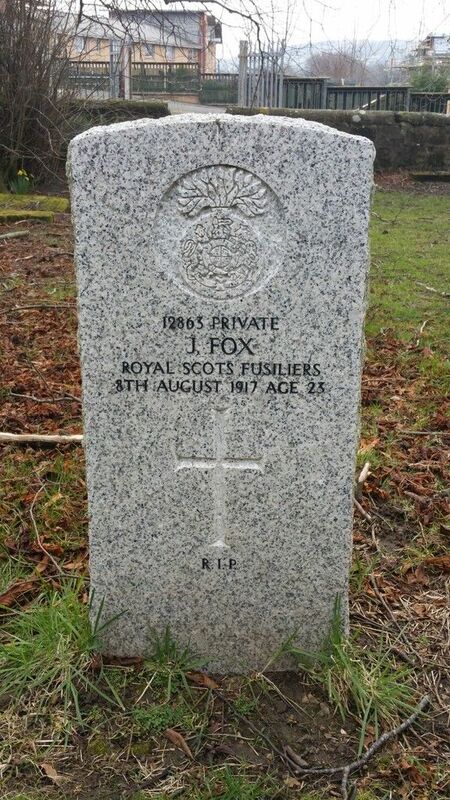 Additional Information: Son of Mrs. Mary Fox, of 48, Canal St., Paisley, Renfrewshire. Born at Barrhead.